Recovering from a no-longer-recent divorce and in desperate need of vacation, Cass Logan made her reservation at the Inn at Sinclair’s Point and was on her way to Cannonball Island - where she not only plans to relax, but to work. As an architect in her father’s construction company and lead architect on a new project set in Cannonball Island, she already has her work cut out for her. With a declining population and a great opportunity for small getaway homes, she plans to develop land and reconstruct homes to provide a vacation destination that’s not only rich in personality, but history, too. When a wrench in her plans occurs, she finds herself staying a little longer than she planned, and she gets a lot more than she bargained for - especially when she catches up with Owen Parker, an adventurous diver with a restless spirit. Owen, transfixed by the fact that he can get every other girl to fall for him but Cass, finds himself more drawn to her. After spending countless years trying to stay away from home, he is offered a diving position with an old friend to uncover a sunken ship, the same ship that’s putting Cass’s plans to the side. While the job is a plus, it’s not just the job that called him back to Cannonball Island. Could she be it? For now, he will just use the excuse it’s for his Great-Grandmother Ruby’s health and his sister Lisbeth's wedding. As the project stalls and Cass becomes more acquainted with the island, Owen, and it’s people, she finds herself falling in love with it - and him. With an even deeper interest in preserving the Island’s heritage and history while creating deeper ties to it with her construction company, she begins to realize that maybe this is her home. But with their brand new love and uncertain future, are Cass and Owen ready for what lies just around the corner? The Chesapeake Bride was a sweet and enchanting read. Set in a small coastal town where the families are close and the history is rich, this book made me want to visit the setting for myself. The characters were hard not to love. Ruby is enticing, Cass is relatable, but I love Owen especially. For as tough as he seems and as knowledgeable as he is, he is a little naive and clueless. Without giving too much away, most would put two and two together when it comes to the conflict he is about to face, and it’s extremely cute how he never saw the event coming. Owen and Cass’s story may come off as a little cliche, but the romance and evolution of their love - while quick - is both relatable and endearing. 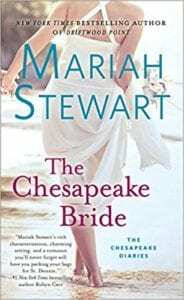 If hearing more about them wasn’t motive enough to read the next book, perhaps the cliffhanger of another Chesapeake Bride-To-Be is. Quill says: With light conflict and change on the horizon, The Chesapeake Bride is the perfect Autumn book.